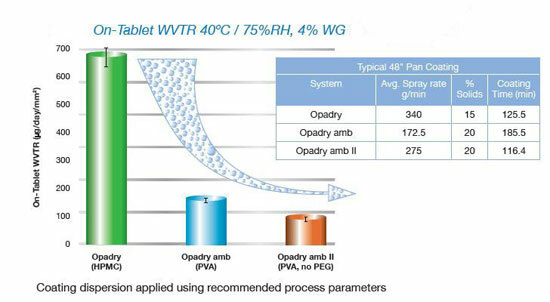 Opadry amb II, high performance moisture barrier film coating, is the first fully formulated PVA-based immediate release system without polyethylene glycol (PEG) that delivers the three-fold advantage of high productivity, low impurity levels and a superior tablet finish. Tablets coated with Opadry amb II exhibit a high-gloss, quality appearance with well-defined logos. Suitable for use in major pharmaceutical markets and developed using compendial ingredients that meet the regulatory requirements of the user, regionally or globally.